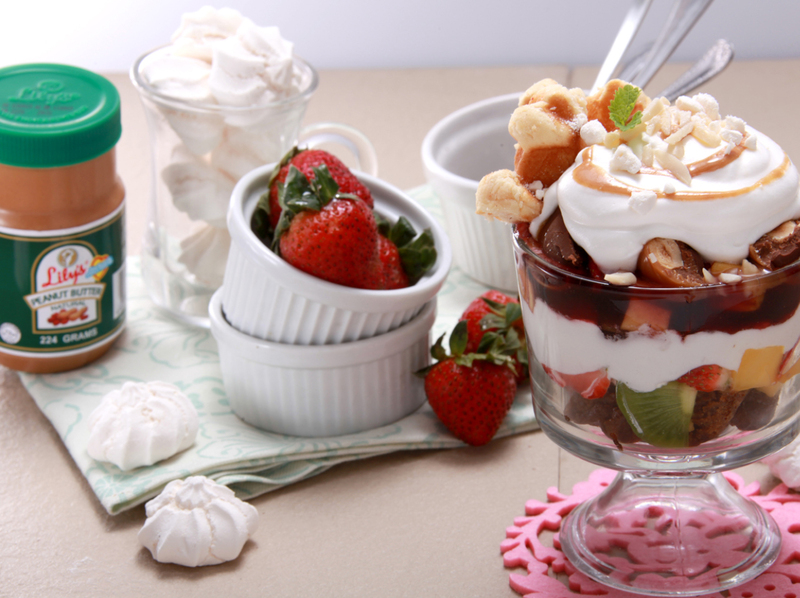 A variety of fruits and savory poured into a glass of heavenly goodness, covered with a Belgian waffle, slivered almond and its superlative ingredient, Lily’s Peanut Butter! Keeps you delighted while improving memory function and helping your heart healthy without suffering from boring foods. This cancer-fighting, weight regulator, and the antioxidant-rich food are a YES in your diet! The compilation of season’s best flavors promises an indulging healthy certainty that a tempting flavor will delicately dwell from fork to fork. In a serving glass, arrange the first seven ingredients aesthetically Top with a Belgian waffle, slivered almonds, peanut butter sauce, mint leaves, and meringue. Combine and heat whipping cream, sugar, butter, and vanilla in a saucepan until all ingredients are dissolved. Let the mixture cool then add Lily's Peanut Butter. Stir well.